(CNN) -- Cricket's Indian Premier League (IPL) will go ahead this season despite fears over security in the wake of the terror attacks in Lahore earlier this week. Modi remains confident that the second edition of the IPL will go ahead this year. Further doubts emerged after home minister Palaniappan Chidambaram initially requested that the Twenty20 tournament be held after the completion of the Indian elections. But an accommodation appears to have been reached and IPL commissioner Lalit Modi said the second edition of the lucrative tournament will go ahead with a few changes to schedule. "Let me assure each and everyone concerned with the tournament, that we will leave no stone unturned to provide our cricketers, fans and stakeholders alike the best security arrangements," Modi was quoted on official IPL Web site. "We are working in close conjunction with the Indian government, the State governments and franchisees for the safe and successful conduct of the tournament in 2009." The eight-team tournament, which runs for six-weeks from April 10 to May 24, has attracted many of the leading players in world cricket. Gunmen attacked a convoy containing the Sri Lankan team as they headed to the Gaddafi Stadium for the third day's play in the second Test against Pakistan, leaving six policeman and a driver dead. Late last year, the England team went home early from India in the wake of the Mumbai terror attacks but returned to play a rescheduled two-Test series just before Christmas. 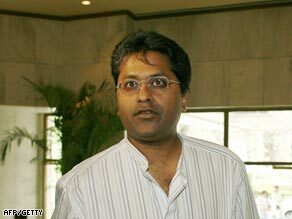 But Chidambaram is giving assurances about player safety after persuading Modi to move some of the IPL matches. "Cricket is always safe in India and nobody need worry about playing in India," he said. "We will ensure safety when the matches are played." Modi added that security would not be an issue. "There are no reservations about security. We are fully prepared on that front and we will have a detailed briefing with our security experts next week," he said. He also dismissed reports that the IPL could be moved to another country, calling them "baseless theories."